Caller ID based routing allows you to route or reject calls based on the caller's phone number. It allows you to create simple rules that places full control of where calls are directed to within your company. Based on the caller ID, you can route calls to any type of destination on your account. This has several uses. For example, you could direct certain phone numbers straight to their account manager. If you have more than one office, you could direct calls from specific area codes straight to a regional office. If you have a specific out of hours phone number, you can add all of your existing customers to your control panel directory and only accept calls from them. And if you have problems with a nuisance callers or withheld numbers, you can reject these even before your phone rings. To configure caller ID based rules, click on Caller ID Routing in your control panel. Use the Create Caller ID Rule area to select an unused internal number to assign to the rule. Chose a descriptive name and click Create. You have several different rules that you can configure. If you wish to divert withheld numbers to a specific destination, select where from the dropdown box alongside the caller ID rule entitled Witheld. You can also chose to reject such calls. If you leave this box blank, any withheld numbers will be routed to whichever destination is chosen in the Default caller ID rule. You can also route any calls from entries in your control panel directory to a specific destination, simply chose from the dropdown box as above. You can of course create multiple rules for different types of number. Finally you can set the default destination for all inbound calls. By default, any caller IDs which do not match a rule will be rejected. Therefore we recommend setting a default destination to avoid unexpected behaviour. Why are most of my inbound calls being rejected? If you find that calls are regularly being rejected, check whether you have set a default rule. When a new caller ID based rule is created, initially all calls will be rejected. This will change once you add rules (for example, setting a destination to any telephone number in your directory). However any caller ID which doesn't match any of these rules will be rejected. Therefore it is worthwhile setting a destination in the default dropdown box as a fallback for any calls that don't match any of the rules you create. Always ensure you assign your new caller ID rules to one of your external numbers or a group (such as a hunt group or voice menu). 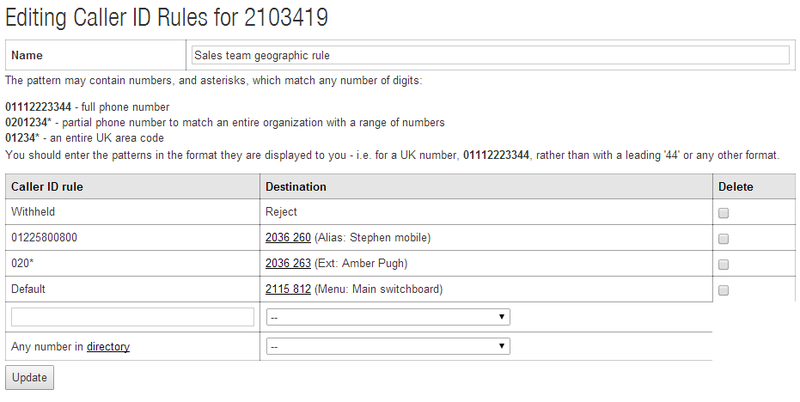 You can assign your rules to an external number in the Phone Numbers section of your control panel (within the Configure menu). If you have done this and calls are still not routing as expected, it is worth carefully checking the caller ID rules, bearing in mind the priority each type of rule is given.